There is no doubt that Nutrisystem is one of the most effective and trusted weight loss solutions in America. However, there have been numerous debates about the secret to its effectiveness, with many believing that the company’s Turbo shakes are responsible for such great results. We have decided to put this theory to the test and discover whether Nutrisystem Turbo shakes have what it takes to burn inches away and help you become a slimmer version of yourself. 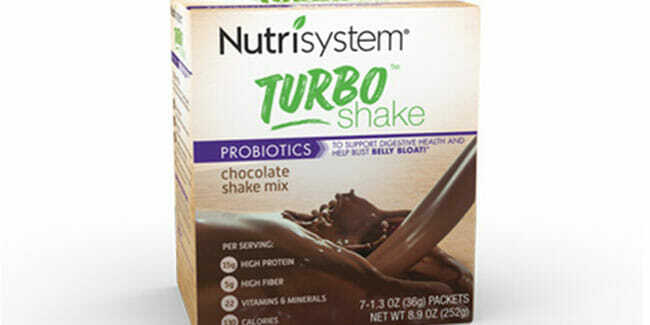 Nutrisystem weight loss meal delivery has designed Turbo shakes to facilitate weight loss in women. The shakes promote fat burning, reduce cravings, and naturally improve digestion. They are chock-full of minerals, vitamins, fiber, and protein. What makes them different than other similar shakes is that they contain Nutrisystem’s proprietary probiotic blend. You are advised to enjoy 3 Turbo shakes per day. Nutrisystem Turbo shakes contain up to 150 calories per serving, which is why they constitute a great high-fiber, low-calorie solution that prevents you from feeling hungry throughout the day. Nutrisystem Turbo shakes are complex concoctions containing just around 50 different ingredients. Many of them are not that important and fall into the sweetener and coloring categories. However, it is worth noting that Nutrisystem was careful when choosing colors and sweeteners as well, picking healthy options such as stevia leaf extract and fructose, with the latter being particularly important for diabetics, as it helps stabilize blood sugar levels. Folic acid, which plays a vital role in cell metabolism and supports energy production. The careful combination of the above-listed ingredients ensures that Nutrisystem Turbo shakes support the normal functioning of your entire body. From making your skin healthier to speeding up your metabolism and preventing cancer, inflammations, and other conditions, these shakes fix issues that may be troubling your organism and preventing you from reaching your goal weight. Thus, Nutrisystem Turbo shakes do not only help reduce cravings. They also significantly improve your health, making sure you lose weight the right way, without negatively impacting your wellbeing. Do Nutrisystem Turbo Shakes Work? Now, this is a tricky question to answer. In line with everything said so far, Nutrisystem Turbo shakes certainly have major benefits. They can make you feel better and help you lose weight more easily and quickly. They are designed by experts who understand how weight loss works and care about making you slimmer and also improving your overall health. However, it is not enough just to enjoy 3 Nutrisystem Turbo shakes a day to lose weight. You need to strictly follow the Nutrisystem guidelines, which includes enjoying Nutrisystem meals that are low in calories and optimally balanced. It is further crucial to stay active. Without engaging in moderate physical activity for at least half an hour a day, no diet or dietary supplement can work as expected. Therefore, we can conclude that Nutrisystem Turbo shakes work but should be combined with a proper diet and regular physical activity in order to yield maximum results.